Genesis 24 tells the account of the servant of Abraham who was sent back to Abraham’s relatives to get a wife for Isaac. Rebekah had a servant’s heart. The name of Abram’s chief servant and steward of his house was revealed in Genesis chapter 15. 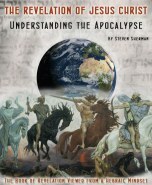 Most commentators agree that the senior servant referred to in Genesis chapter 24 was most probably Eliezer whose name means, “God is help”. I believe the reason that Abraham’s senior servant is not named at this point, is the emphasis of this chapter of the Bible is on the nature of servanthood and obedience. A true servant is not serving for personal recognition but serves in humility and with a willing heart. The act of Abraham having his servant place his hand under his thigh was an acknowledgement that the promised Messiah would come from the seed of Abraham. The servant swore an oath that Isaac’s wife would be taken from the blessed line of Shem and not the cursed line of Ham. Yahweh, the God of heaven and earth, made a covenant with Abraham and promised the land of Canaan to Abraham’s descendants. Isaac was to remain in the Promised Land even if a woman from Abraham’s family would be unwilling to return with his servant. The angel of the LORD, the pre-incarnate Messiah, would assure that Abraham’s servant would complete his journey to the town of Nahor. This town was named after Abraham’s grandfather. The journey from the south of the land of Canaan to Haran, where Abraham’s family had settled, was a distance of approximately 700 miles. Camels can cover 25-30 miles per day carrying a load of up to 300 pounds. It probably took at least a month for the journey. Now, outside of town as the cool of the evening approached, the ten camels knelt by the well. Abraham’s servant had been with his master for many years and had witnessed the great blessings, favor and wealth the LORD had bestowed on Abraham. But far from being envious of his master, his servant entreats the LORD to be gracious to Abraham and grant him success in obtaining a wife for Isaac. To be sure that she would be the one that the LORD chose for Isaac, the servant asks for a sign from the LORD. Rebekah was the daughter of Abraham’s nephew Bethuel and the granddaughter of Abraham’s brother Nahor. Abraham sent his servant to get a wife for his son Isaac from his own relatives. Before his servant had finished praying, Abraham’s great niece Rebekah came out with her jar to draw water from the well. Not only was she from Shem’s line, she was pure and beautiful. A camel can drink up to 20 gallons of water at one time. Since water weighs more than eight pounds per gallon, it was unlikely that Rebekah’s water jar held more than three gallons of water. She would have had to make at least six or more trips to the well and back for each camel. Watering ten camels would entail at least sixty round trips to the well. If it only took three minutes to fill the jar, walk to the trough, pour out the water and return to the well – it would have taken Rebekah at least three hours to water the camels. This indeed was a miraculous sign and a demonstration that indeed, Rebekah also had a servant’s heart. Rebekah was rewarded handsomely for her act of servitude. The gold nose ring weighed a beka which was ½ a shekel or equivalent to an ounce of gold. The two gold bracelets weighed a total of ten shekels or four ounces of gold. Then after enduring an arduous month’s trek of 700 miles by camel, Abraham’s servant praised the LORD for success in his journey that led to house of his master’s relatives. Being a diligent faithful servant, who had his master's interest at heart, he preferred to deliver his message and explain the purpose of journey to his necessary food. “She quickly lowered her jar from her shoulder and said, ‘Drink, and I’ll water your camels too.’ So I drank, and she watered the camels also. Abraham’s servant recounts the entire scenario to his audience. He begins with the charge his master had given him and the purpose of his venture. Then he continues by letting them know the divine favor he had received from the LORD. Now that they know the entire picture, he awaits their reply. Both Rebekah’s brother Laban and her father Bethuel acknowledged that it was the LORD’s will for her to marry Abraham’s son. The desire of Abraham’s servant was to fulfill his master’s wishes with the help and guidance of the LORD. After receiving the approval for Rebekah to become Isaac’s wife, the first thing he did was to worship the LORD in thanksgiving. Then he paid Rebekah’s family a lavish bridal price. Rebekah did not hesitate but was willing to immediately fulfill God’s calling for her life. She, like Abraham, was willing to leave her family and her country and dwell in a land far off. The family’s blessing upon Rebekah was prophetic. It was literally fulfilled when the twelve tribes of Israel took possession of the Promised Land under the leadership of Joshua. Isaac went out to take the advantage of a silent evening, and a solitary place, for meditation and prayer. When he looked up, he saw Rebekah who was not only outwardly very beautiful but who had the willing and obedient heart of a servant. So she became his wife and he loved her. In Genesis chapter 22 according to the command of the LORD, Abraham was willing to offer up his son Isaac as a burnt offering. Abraham, who was well over 100 years old, could not have forced Isaac to be bound and laid upon the altar. Isaac willingly laid down his life. Even if it meant that he had to die, Isaac submitted his will to the will of his father. In this is prophetic picture of the coming Messiah, Father Abraham typified God the Father, while Isaac foreshadowed the sacrifice of God the Son. Abraham’s servant sojourned from the Promised Land to the country of Abraham’s relatives to get a bride for Isaac. 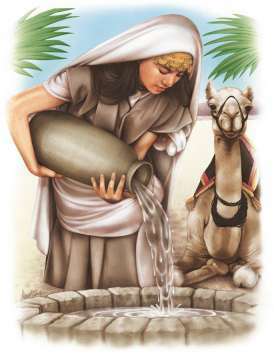 Rebekah was chosen because she willingly drew water from a well. This scene is reminiscent of the account of the woman at the well in John chapter 4. The Samaritan woman said to him, “You are a Jew and I am a Samaritan woman. How can you ask me for a drink?” (For Jews do not associate with Samaritans). The Holy Spirit is the “living water” who regenerates those who have placed their trust in the finished work of Messiah on the cross. Abraham’s servant, who was sent by Father Abraham to get a bride for his son Isaac, typifies the Holy Spirit who came down from heaven to indwell and prepare the Bride of Christ. As Rebekah was chosen by the LORD to marry Isaac, the Bride of Christ is betrothed to God’s Son according to the Father’s will. Rebekah, the beautiful virgin who was obedient to the LORD’s calling for her life, pictures the spotless bride of Christ. Isaac loved his wife. So, in much greater measure, does Christ love His bride.